Today the U.S. Department of Health and Human Services released a full report on enrollment data from October 1 – December 28 and highlights are below. As reported in late December, over 2.1 million people had enrolled for health insurance through the new healthcare marketplaces (exchanges) and another 1.58 million enrolled in Medicaid. While this fell short of the administration’s goal of 3.3 million, the figures were positive and represented strong improvement from the lethargic enrollments in October and November. Initially the state-operated exchanges were performing better than the federal government’s, but the trend reversed in December and are now enrolling individuals are a faster pace that’s expected to continue in 2014. There was also a great trend of women enrolling. This isn’t of much concern but it means the administration needs to find better ways to persuade men to sign up for coverage. The next chart is a breakdown by age and it’s the most critical area for the administration and for the success of the Obamacare. The government stated the right balance of healthy and sick people on the exchanges – in order to produce affordable premiums – is where 40% are of age 18-34. Or approximately 2.7 million people through March 2014, when enrollment period closes. The accompanying chart shows the exchanges aren’t hitting that goal. Just 24 percent of those who have chosen a plan were between 18 and 34. In comparison, the largest share of enrollees – about one third – are 55 to 64. The right section of the chart shows the uninsured population which is a dramatically different profile than those that are enrolling. Either only the older and sicker population are interested in Obamacare or young adults are simply taking their time to sign up, perhaps doing so before the critical March 31 deadline. 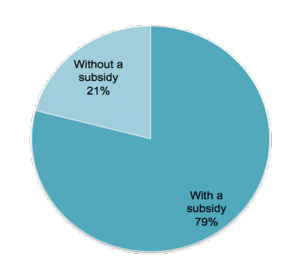 The final chart indicates the mix of those that are receiving government subsidies to help pay for their health coverage. Individuals making 45,960 or less can qualify – or about $94,200 for a family of four – and the current mix is about 4 in 5 applying will qualify. You can check if you qualify here. Mike Hash, director of the HHS Office of Health Reform, told reporters Monday that “the trends so far are suggestive of an appropriate mix in the marketplace… We expect an increase in the proportion of young adults as we go forward.”While the Whitehouse hasn’t met it’s goals for either total sign ups for demographic breakdown, the raw data does those those goals are within reach. Just 11 weeks remain before the enrollment period ends for insurance coverage on March 31.